This fanciful tale centers on Kristin Kakes, a high school sophomore, who is a perfectionist in every way. She has her entire life organized and planned out, I'm sure you know the type. She craves accomplishment and wants to be acknowledged for said accomplishment. The supporting character and epic hero, or antihero, is Tommy Amsterdam. Tommy is the opposite of Kristin in every identifiable way. He doesn't worry about the future or organizing his own pockets, let alone his life. However, Tommy and Kristin do have one thing in common: they need to escape detention. 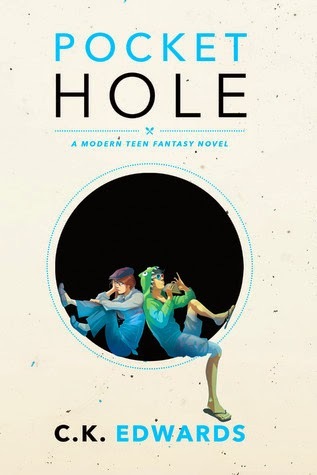 The pocket hole is their entrance to a new fantastical world of excitement and possibilities, but can they handle it? Pocket Hole is a quirky adventure, one I was more than pleased to go on with Kristin and Tommy. I was either smiling or laughing at least twice per page. If you enjoy Scott Pilgrim and Adventure Time, this book will be a unique addition to your collection. It is fast paced, engaging, and the characters were well developed. I was impressed with what Edwards was able to create in such a short work. There is a drawback though, one I really couldn't overlook, and it was the way Kristin's character becomes sexualized as the story progresses. Without giving too much away, there is a point in the story when Kristin is forced to wear something she is not comfortable wearing, and it sexualizes her as a character. There were times when I felt as though she was losing her strength and independence, which in a way help her to grow as an individual, but I didn't like the idea of her being controlled by the men around her. The story was powerful and engaging when Kristin was able to assert her own potential, independent of outside influences. Although I did have that one glaring issue with this story, I still can't wait to see what else C.K. Edwards produces and I really hope there will be more books about Kristin and Tommy to come. I loved the world in Pocket Hole and am curious about what else it might produce. There is a graphic novel that is also entitled Pocket Hole, illustrated by Alex J. Bell, that covers the first half of the complete story told in Edwards' narrative. I highly recommend looking into reading that as well because the artwork is amazing and I appreciated being able to see everything come to life, especially Tommy's unique hoodie and glasses. I decided that the best drink to accompany reading this book would be a samoa milkshake with extra coconut and two cherries on top, be sure to have pieces of the cookie crumble in there too. The girl scout cookie part will be obvious upon reading, I picked that specific cookie because I love how the chocolate and caramel compliment each other so well and don't overpower one another. Just like Kristin and Tommy. The extra coconut is essential because this whole book is pretty nutty and has some tropical aspects to it. Two cherries are also necessary in the same way that a mini fruit pie is necessary, just trust me on this one.